دکتر مولر قبلا هم چند DVD آموزشی در مورد آخر بازی رخ ارائه و تدریس کرده است درمحصول جدید روی جنبه ی عملی آخر بازی به عنوان مخالف جنبه ی تئوریک تمرکز کرده است دراین محصول مدرس بینندگان را تشویق می کند که برای خودشان فکر کنند و به منظور توسعه - و استفاده از - شهود شطرنج به جای تعصب پذیرش قواعد ذر آخر بازی رخ از شهود شطرنجی خود استفاده کند. The first chapter concerns battles with a Rook against a pawn (or pawns). The subject may sound simple enough, but to show that the material on offer here is definitely not of a trivial nature, consider the very first position. 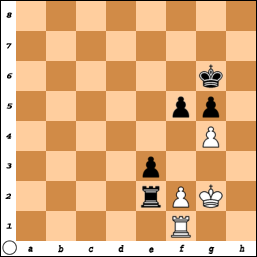 According to Dr. Mueller, there is only one winning move here for White. Would you be able to find it over the board, if you didn’t already know the technique? So right from the start it is clear that this DVD will require hard work from viewers – which is, of course, a good thing. 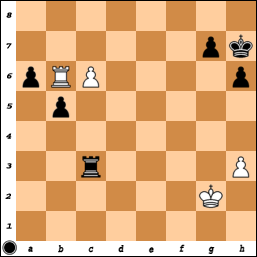 The second chapter examines topics such as ‘the king needs a place to hide’ and ‘typical winning technique against a blockading rook’. Here’s an interesting and instructive passage of play from the section called ‘The rook is in full control’. I think a lot of players would see the white c-pawn as public enemy number one here and focus on trying to win it by bringing the king across to the queenside. Unfortunately, if all of the queenside pawns are swapped off then the game will be a theoretical draw, so another plan is required. So Black plays 45 …Kg6! 46 Rxa6 Kh5 47 Rb6 Kh4 48 Rxb5 Rc2+ (‘the c-pawn is not important’) 49 Kg1 Kxh3 and the kingside pawns were able to roll forward, unopposed, to victory. 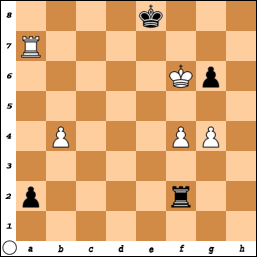 I found it very instructive how ineffective the c-pawn was, because the Black Rook was always in the right place to prevent it from running forward with promotion in mind. The most important part if this chapter concerns the creation of an umbrella, which is best demonstrated by the following position. 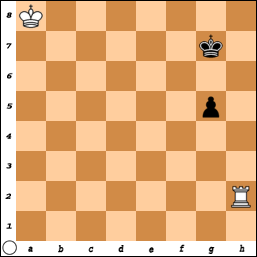 The 4th phase comes after the opening, middlegame and endgame. It’s when both sides go on to promote a pawn. This is a shorter chapter than the rest and it examines the factors which will tip the scales in favour of one side. King safety is of paramount importance. This chapter is all about active Rooks v passive Rooks and how to handle such positions. This is a long chapter, with a special emphasis placed on the art of how to ‘Be careful when simplifying into a pawn ending’. Even top players can make mistakes when it comes to this. 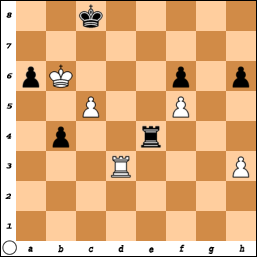 White’s best try would have been 66 gxf5+ Kxf5 and now 67 Kg3 and 67 Ra1 both draw. Van Wely tried to seek sanctuary in the King and pawn ending, but he wasn't careful enough and it merely transposed to a clear loss for him.66 Kf3? Rxf2+ 67 Rxf2 exf2 68 gxf5+ Kxf5 69 Kxf2 Kf4 0-1. Although the lessons on this DVD are difficult, they are very worthwhile for keen students of the endgame. The relatively short length of each one, coupled with the excellent presentation skills of Dr. Mueller (who really brings his favourite subject to life) ensures everything remains very accessible to the viewer. This is a great series and definitely one of the brightest jewels in the ChessBase crown.